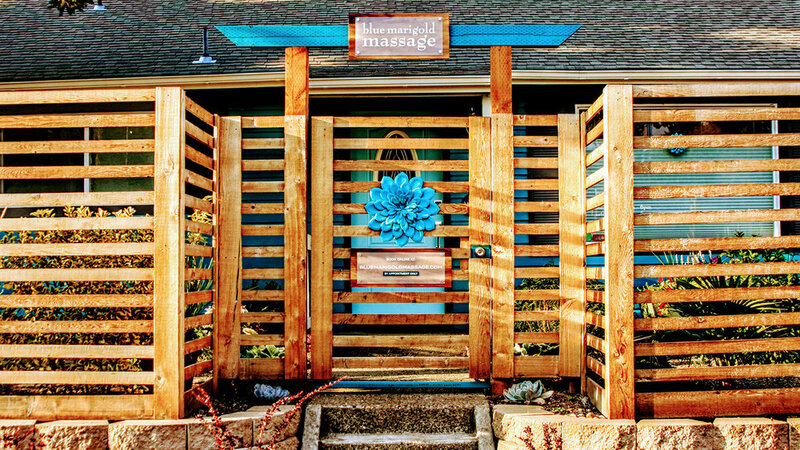 The stunning entrance to Blue Marigold Massage + Wellness. 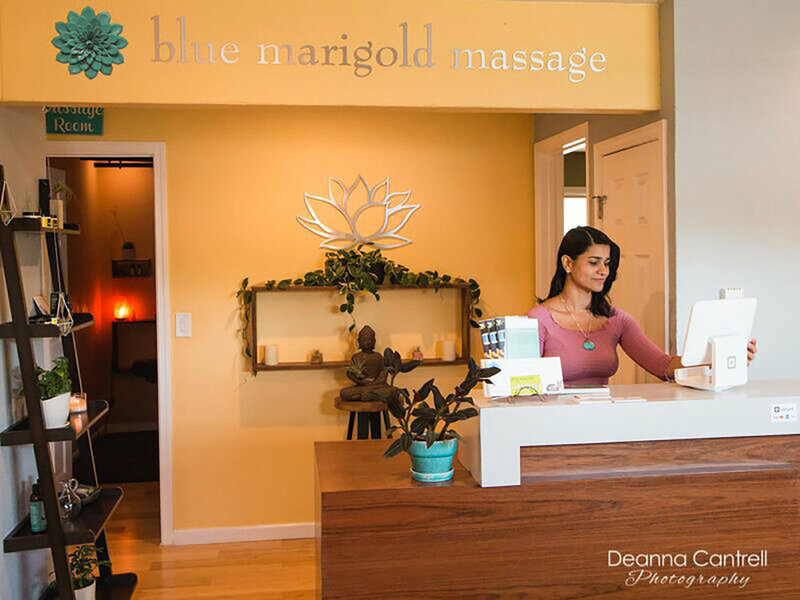 Located in North Portland, Oregon, Blue Marigold Massage + Wellness is a therapeutic sanctuary for healing and relaxation that offers integrated and advanced massage therapies. 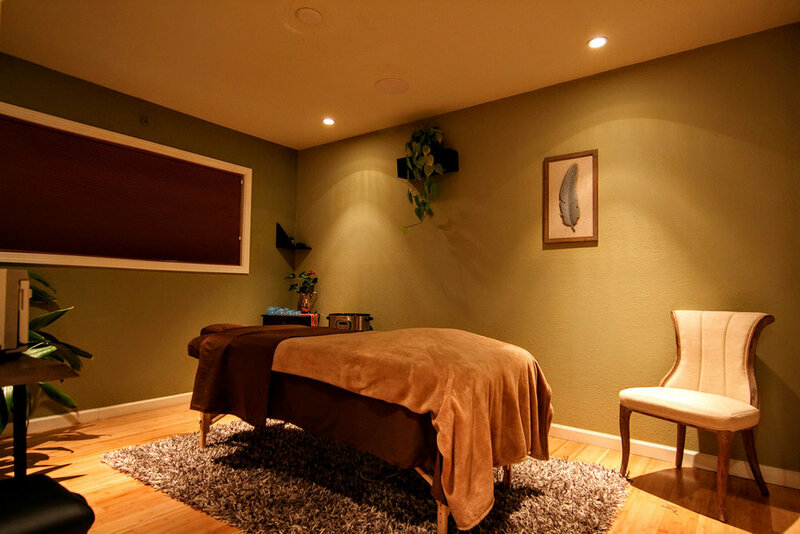 Founded by licensed massage therapist Dali Singh, the top-rated massage studio offers a variety of signature treatments and healing therapies, including their popular CBD-infused massage. We chatted with Spa Manager Sonja Yamin, who shared insider tips, recommended treatments and much more. Why You’ll Love It: Our guests love the community-centered, urban-meets-rustic vibe our spa offers to its local and traveling visitors. From the nature-inspired ambiance to its friendly staff members and therapists, Blue Marigold makes guests feel right at home. From the minute they enter to the moment they leave, guests feel welcomed, nurtured and appreciated. We offer customized treatments for each and every client, whether they wish to combine multiple modalities into one session, or incorporate specific add-ons like Fire Cupping or CBD into their treatments. A buddha greets guests at check-in. Key Features: Our therapeutic sanctuary offers luxurious and spacious treatment rooms, each around 200-square-feet, in addition to a master suite reserved for clients interested in a Duet Massage with their family, friends and loved ones, or specialty treatments like our popular Hawaiian Lomi + Hot Stone Combo massage, or our deeply therapeutic Abdominal Massage (Chi Nei Tsang). Bonus: Clients are becoming more and more interested in exploring ancient modalities from cultures like India, China and Japan. We love to incorporate Thai Massage, Shiatsu, Hawaiian Lomi Lomi, Chi Nei Tsang and Backwalking Massage (which originated from India) into our menu items to give clients a taste of these beautiful cultures from a healing arts perspective. One of the spa’s comfortable treatment rooms. Spa Snacks: We offer all-organic products including aromatherapy infusions for each massage, with no additional charge to clients. All-organic teas and kombucha are served to clients upon entry. Prior to leaving, clients are offered organic dark chocolate treats so they may "adjust back to reality." Splurge Treatment: The ultimate splurge treatment would be a CBD-infused massage with an eclectic mix of Ashiatsu Oriental Bar Therapy, Hawaiian Lomi Lomi, Fire Cupping and Reflexology. A therapist performs an Ashiatsu Massage on a client. Insider’s Favorite: Our most popular modalities are Hawaiian Lomi Lomi and Ashiatsu Oriental Bar Therapy. Most Unique Treatment: Our Abdominal Massage treatment, also known as Chi Nei Tsang, is one of the most powerful modalities we offer at Blue Marigold. Clients rave about the healing benefits of this modality; whether it's for pure relaxation and stress relief, or for digestive issues and detoxifying the internal organs, Chi Nei Tsang is extremely unique in its approach to healing. Featured Products: We offer all-organic CBD salves and tinctures by a local farm called Frogsong Farm. Our CBD body oils are from Blue Ridge Hemp. Our aromatherapy products are from Aura Cacia, Floracopeia and Wyndmere. 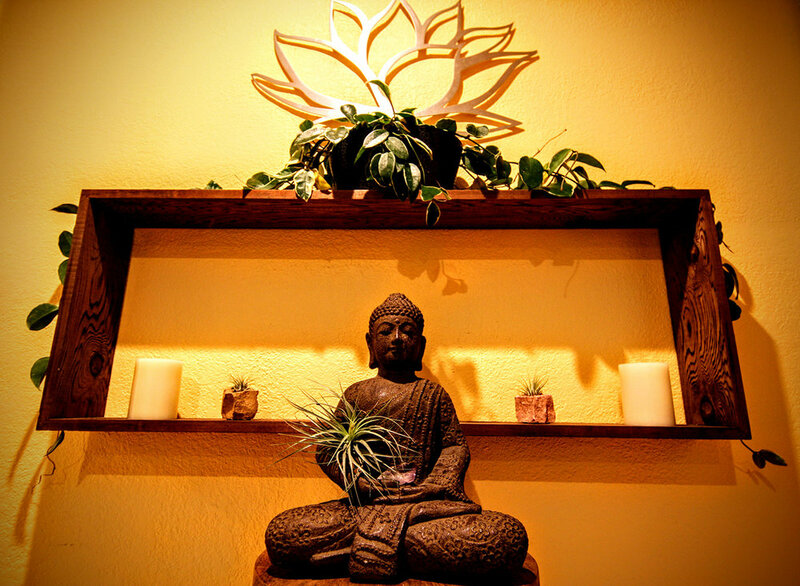 Visit Blue Marigold Spa + Wellness and follow @bluemarigoldmassage on Instagram.